Sizing up Vermont's meanest "loaf"
The wrong grub can provoke some visceral reactions  just ask anyone who was forced to clean a plate of liver and onions as a child. But can food  wholesome, nutritious food  taste so nasty that it constitutes a punishment in and of itself? Some prisoners doing time in Vermont think so. 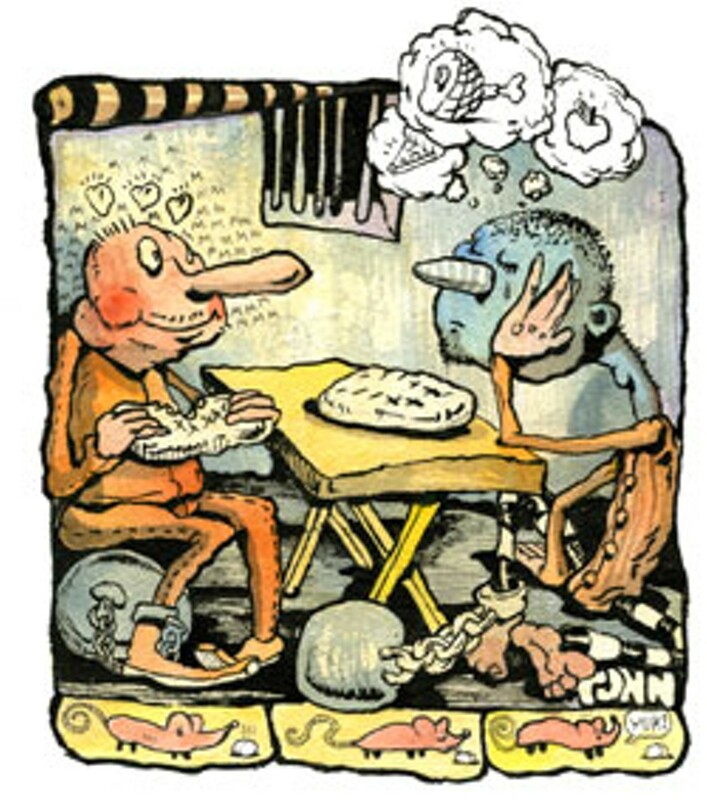 Most of them try to maintain a healthy distance from "Nutraloaf," a "loaf-style form of nourishment" that is typically served to prisoners who "misuse" food or "bodily waste." 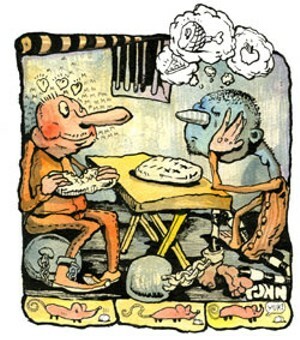 The dreaded loaf may be a fiber-rich composite of all five food groups, but that doesn't make it any more appetizing to the prisoners. Even for the most unruly ones, there's a seven-consecutive-day limit on the stuff. Last month, a lawyer from the Vermont Prisoners' Rights Office helped a few incarcerated critics bring their culinary complaint to the Vermont Supreme Court. Nutraloaf, they contend, is a form of "punishment," and the Vermont Department of Corrections should grant inmates due process before forcing them to eat it. The national press dug into this one. A California Fox News affiliate organized a Nutraloaf taste test at a culinary school. "The bread may not look like haute cuisine," noted Fox, "but it is healthy and high in protein, and made with no additives." So which is it  is the concoction really that bad, or are prisoners just being picky? More generally, what are Vermont's inmates eating, and should we unincarcerated taxpayers care how it tastes and where it comes from? To answer these questions, I decided to go to the Northwest State Correctional Facility for a cafeteria visit and Nutraloaf sampling. Turns out the Swanton facility has only served the stuff once since the 1970s  the plaintiffs in the Nutraloaf case are from Springfield. "But the recipe is the recipe," said Superintendent Brian Bilodeau, promising that staffers could whip up a "tasty" batch for my visit. Earlier in the week, Bilodeau, who has never tried the loaf, caught a staged Nutraloaf tasting on a local television station. Of the several Nutraloaf guinea pigs, he admitted, "Some didn't seem too excited." The Northwest facility is a one-story building on a rural road about 4 miles from St. Albans. Gleaming, barbed-wire fences surround the perimeter, and a sign near the entrance warns, "Secure all vehicles." Inside, visitors deposit keys with a guard before passing through a metal detector. "You might as well be going to the airport," one guard jokes as I remove my shoes for inspection. I meet Dawn Reed, Northwest's food service supervisor, in a pale green hallway beyond the lobby. After a guard buzzes us through an interior door, she leads me into an empty, tiled cafeteria. This building was originally built for juvenile delinquents and still exudes a high-school vibe. In a corner, sunlight reflects off frothing fountains of purply, Kool Aid-like juice. A clamor in the kitchen diverts my attention from the colorful liquid. In there, Reed and I greet several inmates, all of whom are wearing blue T-shirts and hair nets. One skinny fellow, 48-year-old Satnem Singh, dices tomatoes on a metal prep counter. Robert LaBonté, 51, a heavyset St. Albans native, salutes us from a prep station covered with mozzarella cheese. LaBonté's left forearm sports a tattoo of a blood-dripping dagger. Knife skills? The men are prepping lasagna for dinner, Reed says. "Dinner?" I ask, fiddling with my new hair net. "It's quarter after 12." The meal begins at 3:30, explains Reed, an even-tempered woman with a walkie-talkie affixed to her shoulder. Breakfast began at 6 a.m., lunch at 10:30. But they've saved some hot stuff for me. My taste test of local prison food extends well beyond the controversial Nutraloaf, it turns out. LaBonté hands us matching beige lunch trays, and we all sit down at a long brown table. Each tray holds a small bowl of tomato soup and two sizeable grilled cheese sandwiches. The soup tastes a little metallic. But those hot, oozy sandwiches could have come from a roadside snack bar  a little soggy, maybe, but perfectly crisped. Reed dunks hers in her soup, so I politely follow suit. Had I come an hour earlier, she says, I could have helped myself to pasta salad, pickled beets or sliced meats from the salad bar  a rarity in Vermont prisons. In fact, at roughly one dollar per tray, the food-production cost at this facility is only slightly less than that of the St. Albans public schools. LaBonté, who served time in Virginia and Kentucky before landing at this facility, says the high quality of Northwest's cafeteria keeps inmates on their best behavior. That's no accident, according to Assistant Superintendent Scott Dubois, who has joined us at the table. "I think what we do here," the administrator says between slurps of soup, "is a humanistic approach." Dubois, a friendly guy with curly hair, is wary of creating a perception that inmates eat better than low-income people on the outside do. But he also wants the cafeteria to leave a positive impression. "If we released someone to the community, and this experience had been nothing but punishment, they'd be at a greater risk," he suggests. To ease that transition into working life, administrators recruit trained professionals to teach food-service classes. Last year, more than 20 Northwest inmates received "ServSafe" certification through the National Restaurant Association. Earlier this year, 12 enrolled in the prison's inaugural restaurant-management program. Winooski native Matt Maskell, 27, one of the 12 students, says he plans to work in food service when he gets out of Northwest  in exactly four years and seven months. "You guys ever had Nectar's fries and gravy?" asks Dubois. At this point, several other prisoners have gathered around the table. "Oh, man, Nectar's!" someone exclaims. "Beansies is great," suggests Maskell, who has short hair and an angular face. "What's that place on Bank Street?" LaBonté wonders aloud. "Henry's Diner!" "OH, HENRY'S!" the crowd groans in collective nostalgia. These incarcerated prep cooks can't dine in area restos, but Northwest Correctional does support a handful of Vermont businesses. The St. Albans Cooperative Creamery supplies dairy products. Napkins, cups and plastic utensils are trucked in from White River Paper Company in Hartford. Sysco food shipments are supplemented by North Springfield-based Black River Produce. The prison cranks out its own product, too. Between the walls and the barbed wire lies a 4-and-a-half acre garden. In peak years, inmates grow up to 40,000 pounds of produce, half of which is shuttled to a local food shelf. "Prison" doesn't immediately come to mind when you spot a "Buy Local" bumper sticker. But the Agency of Agriculture, Food & Markets sees Vermont's nine correctional facilities as potential epicenters of the state's expanding localvore movement. Unlike its schools, prisons are in session all year. That makes them ideal candidates for state-sponsored farm-to-table initiatives. "Correctional facilities are the primary place where Vermont government directly purchases food," says Helen Jordan, agricultural development coordinator at the agency. "It's a whole new frontier for the types of markets farmers can sell to." In November, Jordan helped produce a report on potential connections between agricultural producers and state government. One proposal would allow correctional food service supervisors like Dawn Reed to purchase "cosmetically damaged crops" from local farmers. That's a feasible option, considering inmates have more time to triage unsightly veggies than do time-pressed chefs at restaurants or soup kitchens. Tomato-chopping Satnem Singh wouldn't mind spending longer hours at his prep station. The bearded Singapore native, a self-described "white collar" criminal, transferred here from Florida because Vermont has a more lenient "grooming policy": Singh is a turban-wearing Sikh. He says that administrators give him enough latitude to whip up dishes such as ginger stir fry or aloo gobi  potato and cauliflower curry. "Every facility has the ingredients," asserts the exiled foodie. "The question is whether they have the means to cook them." So far, prison food doesn't seem so bad. When Reed finally returns with two Nutraloaves, it's as if a waitress were bringing a dish we had ordered, then forgotten. Laid out on a baking tray, the leathery loaves  which are largely unleavened  look awful, like a failed bread experiment. At 996 calories, the bruise-colored, 14-by-5-inch slab is considered a meal. 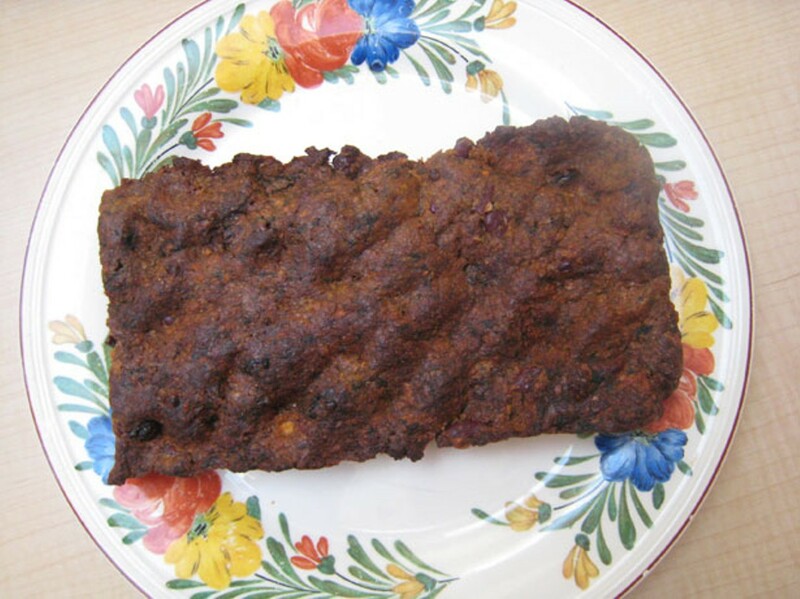 In accordance with state regulations, a Vermont Nutraloaf contains 12 ounces of spinach; 8 ounces of powdered milk; six slices of whole wheat bread; 6 ounces each of tomato paste and potato flakes; 4 ounces each of non-dairy cheese, raw carrots and seedless raisins; 4 tablespoons of vegetable oil; and two cups of beans. "What the hell is that?" someone asks. "No, thanks." "It looks like a flat portion of meatloaf," another inmate observes. Dubois and I break off brownie-sized squares and start chewing. Reed declines, as do most of the inmates. But for a few dramatic moments, they watch us keenly for signs of gagging. None appears. Aside from leaving a pasty aftertaste on the back of my tongue, Nutraloaf is simply . . . untasty. It doesn't taste good, but at the same time, it doesn't taste much worse than, say, a PowerBar that's been languishing under your driver's seat for a few days. Dubois, who has been chewing silently for a few minutes, is similarly befuddled. "I don't know," he says. "I'd eat it. I think it'd be better with milk." "It has milk in it," Reed points out. LaBonté takes a cautious bite and shrugs. "Down in Virginia, it don't look like that, and it don't taste like that," he reports. Adds Haskell: "I've been in the hole, and I don't see it as inhumane to serve it for safety reasons." "I'm a vegetarian, so to me, it's not bad," notes Singh, after a taste; a hair net still covers his beard. "This has to be good for fiber." "It would be better if it were thicker," says Reed, who has been quietly examining the Nutraloaf with some concentration. "We need to get a smaller bread pan," she concludes. Presentation, as they say, is everything. Followed by ambiance.